Firstly I like to think myself as a very tolerant person. I never get angry or argue, I don’t think I have ever hit anyone even at school. As long as people leave me alone then I don’t really care what they identify themselves with. If I don’t like something or someone I just have nothing to do with them until it or them change. However it seems I’m not as tolerant as I always thought I was. 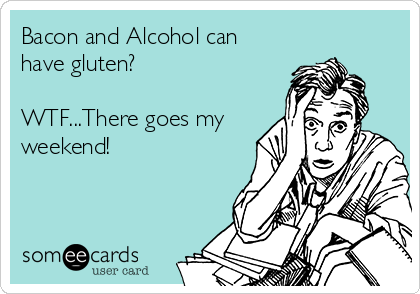 This week after some blood tests I have been diagnosed as being Gluten, Dairy and Wheat intolerant. At this point I should point out that 3 days later, I still think this post title should have had a swear word where the ‘no’ is but I kept that omitted for reasons of taste. Lots of people have been giving up gluten recently, mostly because it is a little trendy to do so, not for any real medical reason. So in a way I’ve been consoling myself that once again I am a trend-setter. I remember another time I was a trend-setter and I had a David Beckham haircut over a year before he copied me. Maybe I wasn’t that trendy or maybe David Beckham could take the pace as 4 months later he found a new trend hairstyle unaware that it would still be trendy with me for several years more! I’ve written several years ago about how I successfully and actually very easily cut out sugary foods from my diet when I went through my pantry and realised my supposedly healthy breakfast of Orange Juice and cardboard…. I mean bran flakes had me breaking the health limits of sugar before 6am each day and that was before the healthy yoghurt etc in the afternoon. I may as well have been eating sweets all morning for they would have had less sugar in them. I’ve always had dietary problems. Food just doesn’t really agree with me. I remember when I was about 3 years old and my concerned mother took me to the doctors clinic as my early days potty routines weren’t as good as they should have been. The doctors gave some medicine for a week which for a time tackled the symptoms but not the cause. It wasn’t their fault, no-one knew about food intolerance then and most people like my father assumed it was my fault for being “stupid”. It was also my fault apparently that I frequently needed new pairs of shoes as I didn’t walk properly. As an adult I asked a doctor about this and he just told me I had flat feet and told me what to do to mostly resolve the issue. Flat feet were something that was known about over a hundred years ago. Walking as I did was and is the only way I can and entirely natural to me and millions of others, I certainly heard of it at school so why no older people in my household had asked the basic question is beyond me. With all that and Asthma which breaks the trend and which I was diagnosed with when young, I’ve got used to living a rather inhibited life, just living with conditions that were my fault but which I couldn’t do anything about except get by as best as I could. Since I was about 25 I always tried to eat the best I could and lost lots of weight which barring the odd blip has by and large been kept off. However even at my most active and eating a diet reminiscent of a medieval monk, I never got to be anything other than just within the healthy normal weight of the U.K. medical guidelines. In fact though I like food in its own way, food always for some reason never really agreed with me. More often than not it would make me ill. Not after every meal but after most meals and if I went more than 1-2 days of feeling properly well then it would be the highlight of the year. I’d often say to my wife how I don’t really want to eat as I like feeling well. I’d rather be hungry and feel a bit better than being full and unwell though I admit that I like eating as much as anyone. Several people would say I had about the healthiest diet of people I knew. I never liked fast food, or cakes or sugary snacks. I like salads, lean meats, root vegetables, soups and wholesome food like milk, wholemeal bread and cheese. Despite all this and in part because of all this, for most of my life have always felt ill. Either headachy, tired eyes, exhausted, bloated face and stomach, feeling unwell or very unwell. One minute I was fine and then minutes after eating I would feel unwell, whether unwell generally or a specific super level of unwellness and I could determine the difference between them easily and quickly. Of course I went to the doctors regularly and would ask them about it when I’m visiting about Asthma or the bad and multi-month chest infections I tend to get in winters but 99% of them just fobbed me off as one of those things. It seemed the older I got, the healthier I was eating and the more unwell I often became. I did put a few things together in my head though. I realised that often when I was on holiday I would feel a bit better, I thought though it was from cleaner air or lack of work worries like any normal person might. I knew that sometimes if ate Indian foods I might be unwell the same day or Italian foods the same night or English baguettes the following day after consuming them. To all intents and purposes I had learnt to cut out the very worst things that made me feel unwell and just have them very occasionally and being aware that I might be a bit unwell from eating some of my favourite foods. I got the hint that I might be gluten intolerant, I read a lot about it on the internet over the years but most sources of information proclaimed that very very few people have a serious problem so when a friend who works at a local pharmacy told me she recognised the symptoms that I should have a blood test and see if it will help me. My friend is a Vegan, largely for health but also for religious grounds and I often felt sorry when I would see the foods she was restricted to and the huge problems she had in shopping for food or eating out. So last week I went in to have my blood test, wondering and indeed expecting to have some sort of wheat intolerance. I had my blood taken and went to a café whilst the results were analysed in the lab for an hour. I’m not a café sort of person, to go to cafe’s you have to go to busy places and spend money on things I can often get cheaper at home. In fact it’s so unusual that I treated myself to a hot chocolate, a cheese scone and a chocolate chip cookie. It sounds bad but I hadn’t had either for a month or two amongst the countless salads, vegetables, soups and stews. I joked with the person who served me that wouldn’t it be bad to be found allergic to these things, all of which are amongst my favourite foods. The server agreed and said it wouldn’t be worth living. 1 hour later, life was officially not worth living. The nutritionist confirmed that I was actually eating a very healthy diet for the normal person but unfortunately I am not normal. I had an extremely strong intolerance for milk and dairy products, a very strong intolerance for gluten and an intolerance for wheat which may be a big deal for others but for me is insignificant compared to the how intolerant I am to milk and gluten. In the worlds of BlackAdder, my feelings rhymed with Clucking Bell. I love milk, it is my favourite drink of all. I have milky cereals at breakfast, sometimes a glass of milk in the day and rare indeed is the day when I don’t have a low-fat milky hot chocolate or a nibble on some cheese. The nutritionist explained how in effect for the last 40 years my body has been in a state of allergic shock. I would sometimes say to my wife that I felt poisoned, no reflection on her cooking as it is not her wonderful home-cooked meals that made me ill, at least not intentionally. That’s not to mention milk in tea. I was put on a strict 3 month plan to avoid the offending food groups to give my body a chance to recover although it could take much longer for my stomach which has spent decades in a poisoned intolerant frenzy. At the end of the year we can revisit the situation and see if any foods can be re-introduced as sometimes some intolerances are temporary. The nutritionist also said that these particular tests have only been around for 2 or 3 years so I had pretty much done everything possible for myself. 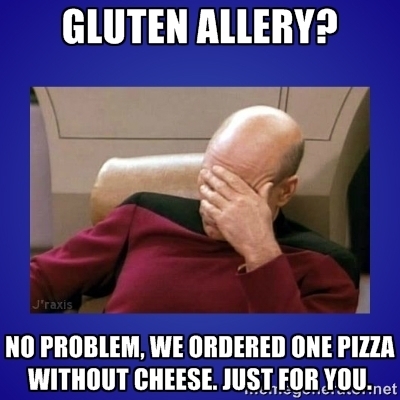 I’m not sure whether it is worse to be dairy intolerant or gluten intolerant. There is no way around it though that to be both plus with wheat too, that it severely changes what you can eat. At least there are some gluten-free alternatives these days, perhaps two varieties of bread loaves which cost three times more and are just a quarter of the size than the hundreds of gluten filled breads. For dairy, though it must surely be scientifically possible, the options seem to be even fewer. If you take a large supermarket, there is a lot there I can still eat from. All the meats, the fruits and vegetables, the fish and all the tins and frozen foods right? Surely losing milk, butter, cheese and bread still leaves you with a good choice. Well I don’t like fish except Salmon and that isn’t something that can change just because I’ve lost many of my favourite foods. If you don’t like fish you don’t like fish, its like not liking eating snails or garlic. I’m also not a huge fan of most fruits. I like apples and soft fruits, grapes, Kiwis, dried apricots, raisins, dates but I’m much more a vegetable person. I love potato, sweet potato, carrots, parsnips ( I LOVE PARSNIPS), peas, tomato, beans, lentils… everything but sprouts, cabbage and cauliflower really. However modern food production means that 75% of the supermarket is a no go area… that’s a big supermarket, not the smaller ones near to me that stock zero gluten or dairy free products. I can eat lentils, I can eat soup but I can’t eat Heinz Lentil Soup. I like Lentils, I really quite like Heinz Lentil soup as I do most other Heinz soups. I prefer my wife’s soups but Heinz will do nicely on a cold winter day when I’m being good and healthy. Except Heinz soup contains wheat and flour. I guess for binding the products together and making them suitably gloopy. Everything is like that, gluten is everyday. Milk or milk components are in almost everything. Some expectedly and some you would never believe. Yesterday it took me two hours to spend £35 / $55 on Gluten Free and Dairy free products. They are few and far between. If you find one item then its a big deal and you forget that everyone else can choose from dozens of similar, better tasting and cheaper brands. I shopped at Asda yesterday and they have a Free From Shelving area. 4 shelves high and a good 10 feet long and that is it amongst probably miles of produce. At one point 5 people were helping me look for their advertised fairy free cheese. It’s understandable as their dairy cheese selection is on around 4 shelves that go 100 feet into the distance. I felt like an idiot until they too couldn’t find it. Some insisted there was no such thing, others thought it would be around here somewhere. In 3 huge aisle of crisps (potato chips) I found two or three brands where I could eat one plain flavour. Only Seabrooks didn’t fill their potato with gluten, wheat or milk and so allowing me a tiny Salt and Vinegar flavoured refuge to last me the rest of my crisps eating life. On my adventures I found a shop worker who also suffered from the same affliction and she was equally flabbergasted. She gave me a few tips including some Swedish ice-cream which I can eat. It only comes in Vanilla but it tastes like real ice-cream and if you go to 2 other major supermarket stores they do it in Chocolate too. Which in a way sums up a big part of the problem I’m going to have. Most of it doesn’t taste like the foods I remember, you have to look all over to find them and if you are lucky to get one, its in a very limited variety. Oh well, that’s looking on things a bit negatively. Someone told me it wasn’t a big deal but I haven’t met anyone who suffers from it dismissing it that way. Around 20% of people in the world have lactose intolerance. Lactose is a component part in milk that if your body doesn’t produce enough of it then can’t be digested easily and makes you ill. Only 1% of people in the U.K. suffer from it as it is largely a problem for people from Asia and Africa whose ancestors didn’t have to adapt to drinking cows milk as we in Europe and North America have done for thousands of years. I guess my Viking ancestors lived in too snowy an area for them to have cows and the same explanation goes for the gluten and wheat issues too except that now these ingredients are everywhere and not just in bread or cakes. I’m sure after a few months I might get used to Soy milk and get to know which foods I can eat and get all excited when i find a new brand of something which shouldn’t contain gluten and then happily actually doesn’t. It is going to make things difficult though and probably less tasty. Take my comfort treat at the café I took whilst waiting for my tests. Hot chocolate out due to milk in the drink and milk in the powder, possibly gluten too in some brands. Likely the cookie is full of milk, gluten rich flour and wheat and the chocolate chips too are full of milk. Then the cheese scone, well cheese is full of milk and the rest of the scone is likely composed of milky, glutenous products as well. Going to a restaurant is going to be fraught with difficulties. 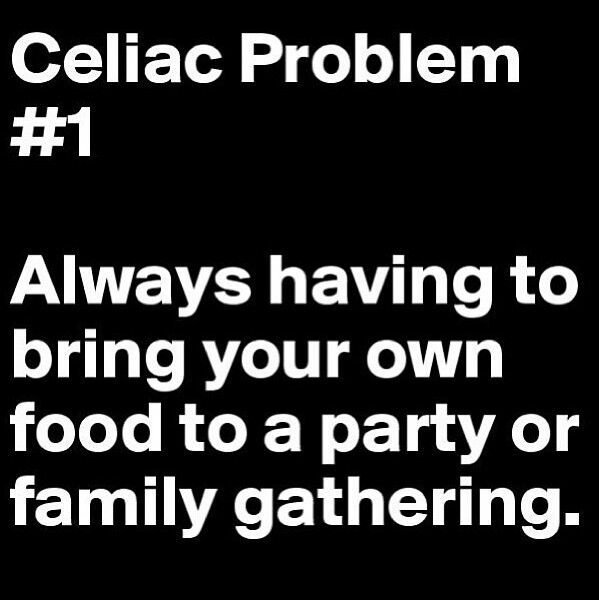 If you can’t eat gluten, you might get by, likewise if you can’t have dairy but both presents real problems (that goes for supermarket food generally). It takes any chance of spontaneity of buying a sandwich, snack or drink away from you unless you’ve found yourself a cosy network of individual outlets that do sell particular items. Whilst society is slowly coming to terms with being gluten-free, dairy free just seems to be a step to far. For instance my favourite fast food is pizza from pizza hut. It says a lot that I’ve only been there twice this year. They have hundreds of combinations of pizza and recently they have started to have gluten-free pizza bases though only in one size and with none of the other fancy crusts or edges that are in the regular varieties. That’s great but they don’t have dairy free or lactose free cheese. Similarly 99% of the side orders, desserts and starters are now going to be no-go areas for me. Some slight relief is that I have been giving what I call a Lactose antidote. If I am unavoidably going to consume dairy products then I take one of these and it will temporarily boost my lactose levels so that I will suffer minimum effects afterwards. Except of course these for one-off occasions and not a basis for continuing with a dairy rich life-style. What will happen with eating at friends houses, travelling abroad, I don’t know. I accept I will be reduced to an even more basic diet as apparently once you go gluten-free, if your body doesn’t recover properly, it does at least get used not to having gluten and so the merest crumb from a toaster or apparently a handshake with someone whose eaten the wrong food can lead to several days of illness, depending on the severity of your intolerance. Despite all this I am a little bit excited. The prospect of feeling well is exciting and probably not one I have ever really known. When these intolerances are resolved, according to the nutritionist I will feel like a new person. Not feeling ill, much more energy, better sleep, better asthma, not bloated or swollen or headachy and a better immune system just for starters. Getting there might be a problem as many people are reported to suffer side-effects as it recovers and begins to accept the lack of dairy or gluten. It’s quite incredible really to think that some people don’t have any intolerances or allergies, other suffer from maybe hay fever for a few weeks that can make them ill for several hours or days but I’ve in effect been suffering similar for the first 41 years of my life and didn’t know about it and for about 38 of those years, no-one on the planet really believed in such things anyway or could easily detect them. I’m just starting my third full day. I’d like to say I am already feeling much better but I’m not. That’s largely due to a horrendous cold I’m suffering from which again could be a side-effect of going gluten-free as many people suffer from very runny noses amongst other things. However already, I am having a few hours here and there where I am feeling very well in my body so hopefully in a couple of weeks or months I will see a real change. Gluten and dairy free sausage rolls. I’m not sure if they are meaty sausages though but if they are I will have to order them rather than buy them from any bakers like normal people. Whilst many foods are now out of reach for me, more and more alternatives are appearing on the market with sales increasing exponentially and its likely that one day I might be able to have a cheesy garlic bread or a Cadbury’s chocolate bar just as today there are countless low-fat or low sugar foods and drinks. What will be nice though is to eat some of the foods I used to avoid because I can have gluten-free alternative. Wow a ham or chicken salad sandwich and not risk getting ill afterwards? That will be amazing. Not being ill will be life-changing. I’m not sure it will work but I’m excited that it might! This entry was posted in Life and tagged Dairy, Dairy Free, food, Gluten, Gluten Free, Health, healthy eating, Lactose, Lactose Intolerant, Life, Milk, Vegan, Wheat allergy. Bookmark the permalink. 15 Responses to Oh no! I’ve been diagnosed as being Gluten, Dairy and Wheat intolerant. Join the club,. hey lifes’ not that bad here in the U.K. Eating out has stepped up tremendously over the past few years. Despite the food being a little more expensive the shops do a good selection. Many items can be got on prescription. Once you have settled into your new diet you will feel tons better. Thanks Mary. I will check those sites out and also next time I am at the doctors speak to them about those prescriptions as that could be helpful with the cost. I am enjoying it in a strange way, finding new foods and being happy when some taste as good or better than the old variety I used to have. How many weeks/months did it take for you to feel better? Sorry to read about your diagnosis, but I hope you’ll be feeling better soon! If you cook, there are lots of blogs and sites with gluten free/dairy free meals. Homemade lentil soup and lentil curries do not require added wheat. I’m not a milk drinker (I usually have unsweetened almond milk here for baking and such because it seems to last for a long time. ), but I would not like to give up cheese. I know there are vegan cheeses though. Can you have sheep or goat cheese or buffalo milk mozzarella? Good luck! Yes, I’m grateful that we do lots of home-cooking here and don’t generally eat out. I think it is just a double shame as milk and dairy are by far my favourite things but also so integral to western diets. Living in China and not being able to eat Cheddar Cheese probably wouldn’t bother anyone. I’ve been told I can try goats milk or sheep milk so I presume their cheese is ok too. I am going back on Tuesday so hopefully will clear up a few things. I’ve been drinking Soya milk but I find it very sweet. It’s fine for cereals but it seems to overpower the flavour of teas. I’m sure you’ll find a way forward though. Thanks for your comments and kind words as always! I’ve stayed off the chocolate and coca cola for about a week and already I feel totally depressed – I don’t envy you at all Stephen! My sister is a coeliac and it’s so sad to see the pain in her eyes when we are all enjoying a Chinese and she can’t join in. Then again, I’m sure she’s much healthier than me! Oh I can relate to that as chocolate is now off my list and coca-cola has gone too as it seemed too unhealthy to keep considering everything else. Your poor sister 😦 I sympathise, always felt sorry for those who had to look for the one item on the menu they could have when you knew they really wanted something more satisfying. If I get stuck for food ideas then I know who to ask then. I can’t believe that you’re anything other than really healthy so your sister must be a wonder. The nutritionist did say that in a twisted way this could be the best thing that happened to me for my health as so many borderline bad foods are just removed from the equation. I’d just like to have the odd one here or there! Yesterday in the supermarket I felt like in a foreign country and you look round the shops looking for something you vaguely recognise or could stomach eating and then feeling elated when you find something bad like Panda Cola lol. 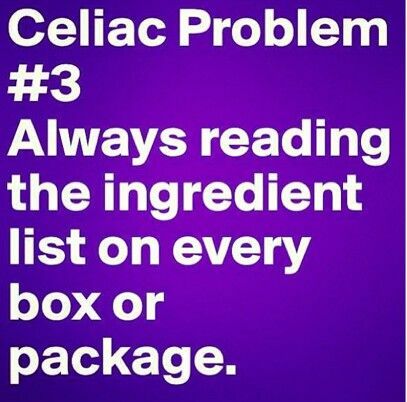 I’ve been eating gluten-free and almost completely dairy-free for years. 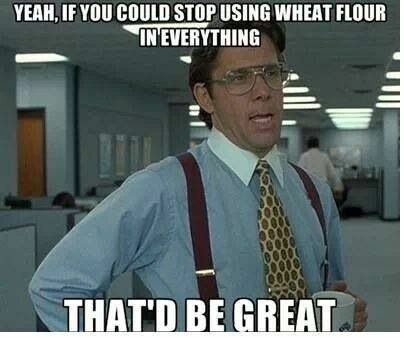 Add in all my food allergies….all grains, all nuts, chicken, eggs, soy, some vegetables. I cheat every once in a while, but not very often. I’m fortunate my other allergies are not food related, just dust, animal hair, pollen etc. If it all works out for me then I’d be happy with the life-change especially if it helps my chest too. I have my little bottle of lactose enzymes calling my name on the table but I don’t want to use them for a long long time. I want to quite properly. I’m the type of person who finds it easier to cut something out totally rather than treat myself because then I find it hard to get back into the usual run of things. Still, the idea of being “well” provides strong encouragement to make the new eating regime stick. As a coeliac of already 15 years I can honestly say that simply gluten free eating is relatively easy now. 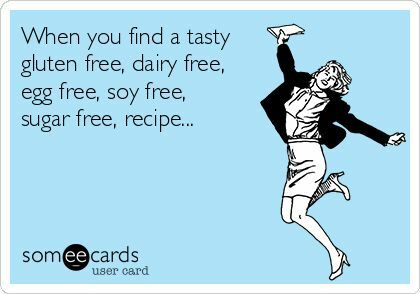 Dairy free makes it more difficult, but not as difficult as grain, all legumes, soy, sugar and some proteins free. But even those, very strict limitations allow to eat well and enjoy delicious and nutritionally balanced food. I speak from my experience on working for more than a year creating gluten, grain, dairy and sugar free recipes for a friend. She can’t have also any pseudo grains – quinoa, buckwheat, any starches and some seeds. It means tapioca, amaranth and some root vegetables out. Why do I mention this? Because even with these restrictions you can eat well. It is a challenge, especially at the start, but life with less suffering is so much better! Thank-you for commenting and I shall certainly be checking out your site. I can see how gluten free eating is getting easier, even compared to a few years ago when I briefly looked into it. Hopefully the Dairy free situation will catch up soon. As you say, it is a challenge probably especially at first but what price a healthy life with much less discomfort and illness. From my perspective I’d rather be well on the new diet and if your friend can then I can too! Thank you, I am going back next week to check whether I am lactose or milk intolerant. I can have sheep and goat milk apparently which is a start. Apart from Gluten I am mildly wheat intolerant but apparently this is mild in comparison to others. 4 days in and my wife says my face is becoming less swollen and puffy. Hopefully the first of many positive changes over the next 3 months. Also as mine goes, my stomach is feeling “nice” which is the rarest of all categories I have for it. Non-suffers will think it bizarre but I have many different levels of stomach discomfort and “nice” is by far the rarest! I don’t know if you can find this, but a lactose-free milk, like Lactaid, tastes way better than soy milk. Soy milk, yuck. Good luck with everything else. It sounds difficult!